It’s not difficult to remember. Bustling cities built in a day in primary blue, red, yellow, green. Pixelated space probes shattering into their component pieces on berber carpeted living room floors. Countertop kingdoms with pulley operated drawbridges. Pastiche combinations of the three, blended into one surreal and chaotic playworld. LEGO, the iconic children’s toy of interlocking bricks, is simultaneously the most versatile and the most forgiving building material in the world. First established by Danish carpenter Ole Kirk Kristiansen in 1932 LEGO began as a a small toy workshop in Billund, Denmark, creating wooden blocks, piggy banks, dolls, and pull-along duck toys. The name LEGO is a portmanteau of the Danish LEg GOdt meaning, “play well”, that coincidentally translates to “I put together” in Latin. Over the years, Kristiansen’s son, Godfred Kirk Christiansen, led the company from a small-time workshop to one of the most renowned and recognizable toy brands of all time. The company bought its first plastic injection-moulding machine in 1946 and by 1949 created the first prototype of its signature Automatic Binding Brick. By 1958 the brick had been updated to the stud-and-tube system still used to this day. Since then, the LEGO brick has become a nearly ubiquitous symbol across the globe. LEGO reports that in 2012, 45.7 billion bricks were produced at a rate of 5.2 million bricks per hour, and more than 400 billion have been produced since 1949. Divided evenly amongst the world’s population, every single person on earth could possess roughly 62 LEGO bricks. The bricks themselves have seemingly birthed an entire generation of architects, engineers, and building buffs. But what it is about this simple toy that accounts for such long term appeal? The answer is in the name: Play Well. Each LEGO set comes with a booklet of specific construction guidelines that can be completely eschewed by the builder in favor of more free form play. 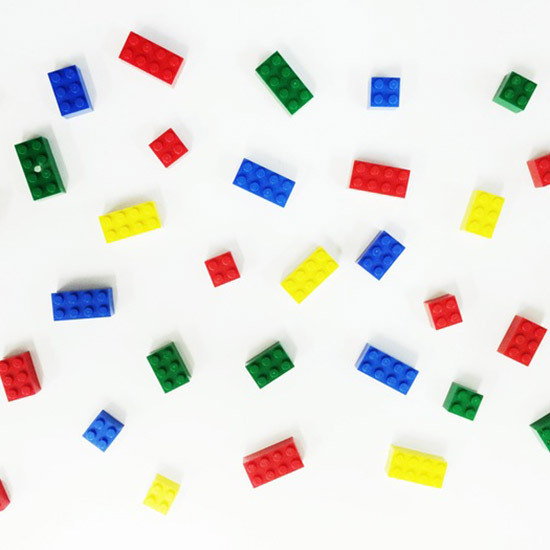 Six 2×4 LEGO bricks can technically be combined in over 900 million unique ways, so as builders accumulate sets, their options for new combinations increase exponentially. And while each block added to a creation-in-progress presents a new direction and endless possibilities, it can just as easily be taken back. Builders are never invested in any one decision. They can make mistakes and then choose to either erase those mistakes, or adapt their designs to them. It is this low-risk freedom that provokes such rabid creativity at such a young age, capturing the minds and imagination of children everywhere. The balance between form and versatility sets the LEGO brick apart from the battery-operated convolution of the modern toy world, drawing builders back time and time again with the endless possibilities it affords. Carried by the promise of its name, the beloved LEGO brick continues to incite joy and nostalgia in the smiles of all those who remember the thrill of breaking ground on LEGO cities, LEGO moonbases, LEGO ice cream cones, LEGO Frank Lloyd Wright houses, LEGO Rothkos, LEGO friends, LEGO homes, LEGO worlds.